Happy birthday ! If you had been around we would have made a big deal of this birthday as you turn 80 … we could have done your “Sathabhishekam”. Well, some other lifetime maybe. For today, we celebrated with your favourite food – the “poli”. I was trying to find some of the pictures from your trip to Delhi when you were still unmarried, but I am unable to find those. I found two special pictures though. The first one is at Radha athai’s house, in May 1993, when you and Amma celebrated your 25th anniversary. We had just setup the computer training centre and were celebrating that too. Since Krishnan’s birthday and your anniversary are a day apart we got two cakes and celebrated both. Most of the family got together and it was special. The next anniversary I remember is your 40th … in 2008. We drove down from Bangalore for just a day and while going back, you came till the Salarjung Museum to show us the way. I waved back at you as Krishnan drove off, not knowing that I was waving at you for the last time. We almost didn’t make that trip, but I guess we had to meet you one last time before you left forever. The above picture was on May 18th morning as Amma was picking flowers, as we had reached only by the afternoon on the 17th. 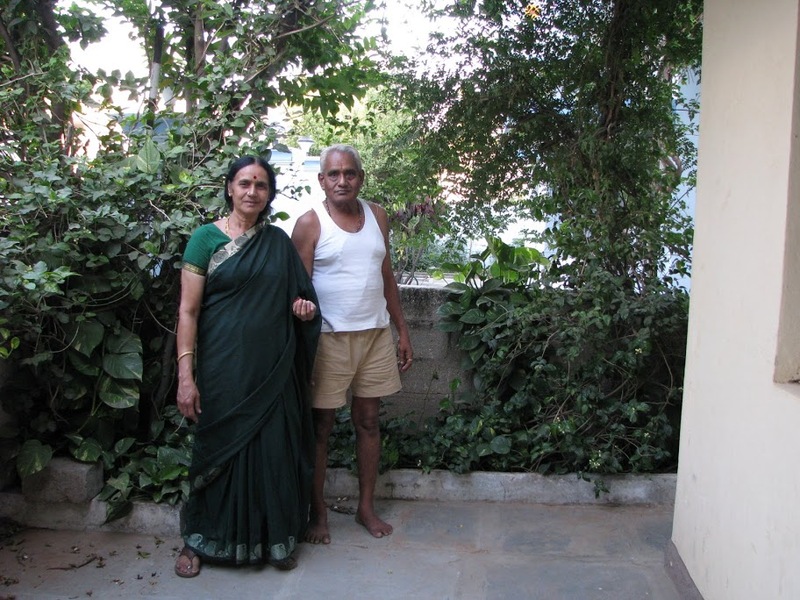 Then Nanu came over and we took a few pictures inside the house even as you got ready to come along with us to show us the way. The above picture was just as we were about to leave and you picked up your trademark cap. The cap is still around, but you aren’t ! Appa, while rummaging through old picture albums I also found this one from our trip to the Andamans in 1995. I wonder why you and Amma were grumpy that morning or were you just making a face for the photograph ? That was a nice trip even though our business was in trouble and within a year and a half we had to shut everything down. Huge stress at that time but this trip helped in alleviating some of that stress. I still remember the “dal” and “roti” that we got at the Navy mess and then our trip on the barge to see how trees were cut and logs made out of their trunks. 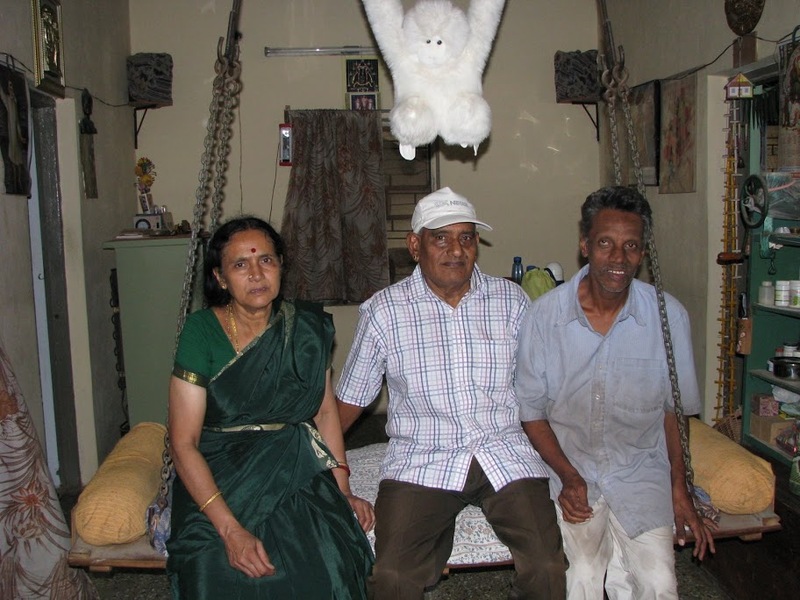 I still remember seeing the flying fishes from the deck of the ship that we took from Chennai to go to Andamans… and that feeling of my stomach churning as the ship rolled and pitched. I was so happy to take the flight back to Chennai :). Life is good Appa, I know you are watching out for us and your presence is felt. Today while walking Amma made an effort to put her hand down like you would tell her to, but she still refuses to lift her sari while climbing stairs. Its cold in Delhi NCR and reminds us of Shillong. Miss you lots. Would have taught you the OPOS method of cooking and I know you would have enjoyed it. Amma just refuses to learn, hahahaha….